Summer grilling season is here! Sunny days, firefly nights, pink sunsets, swimming pools, lazy afternoons, smoothies, salads and of course: vegan BBQ eats! 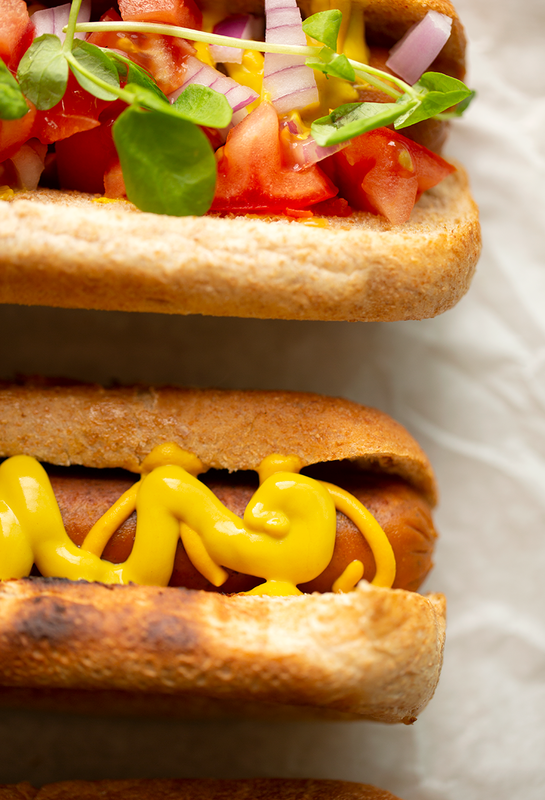 Vegans can enjoy it all during summer BBQ season: veggie burgers, vegan sausages, vegan hot dogs and grill-marked veggies. And veganizing your grill, quite simply, just feels good from the inside out. 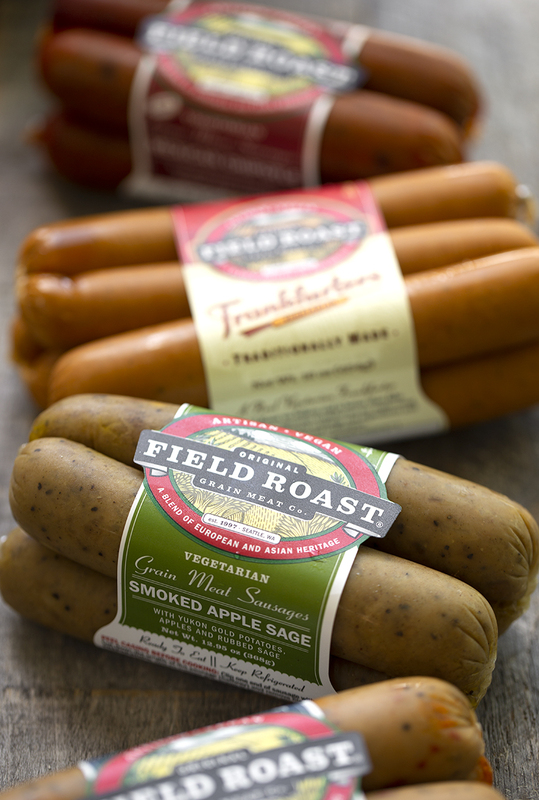 Vegan grilling tastes amazing thanks to one of my favorite products: Field Roast's Grain Meat Sausages. I'm a fan. In fact, I just realized that I have been buying Field Roast products for close to ten years now, because I adore the flavors, ingredients and texture so much. I raved about them, here on the blog in 2009. I routinely stock my fridge with Field Roast sausages and their Frankfurters are my go-to brand for vegan hot dogs. 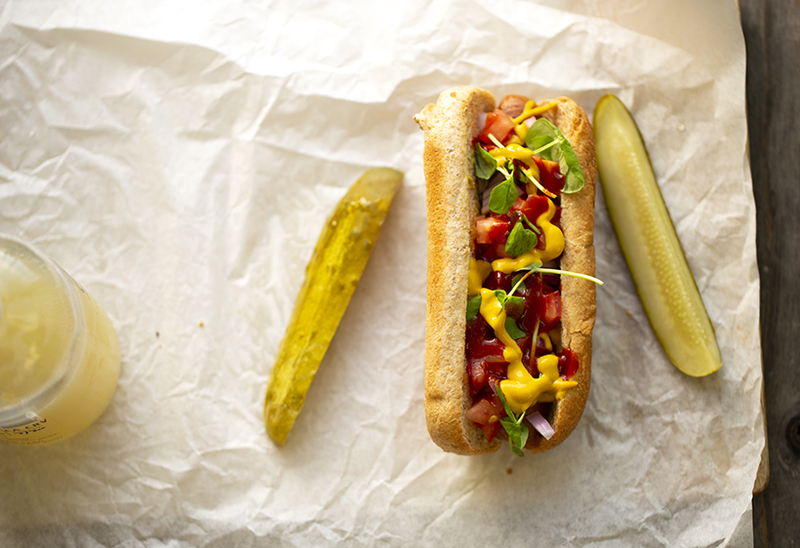 Summer meal: vegan hot dogs. Easy. Flavorful. Family-friendly. Fun! Fast. And totally customizable. 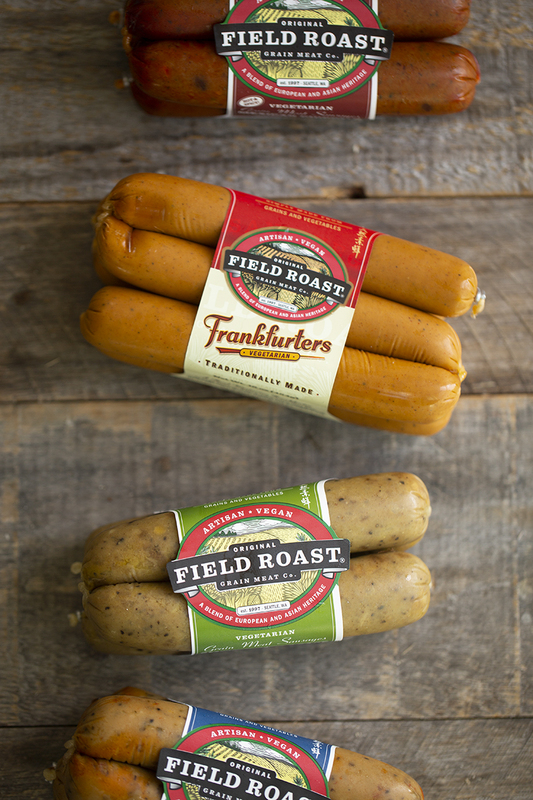 And my go-to 'dog' is the Frankfurter by Field Roast. I love that these vegan sausages are made in small batches, using recognizable ingredients with a point of origin. 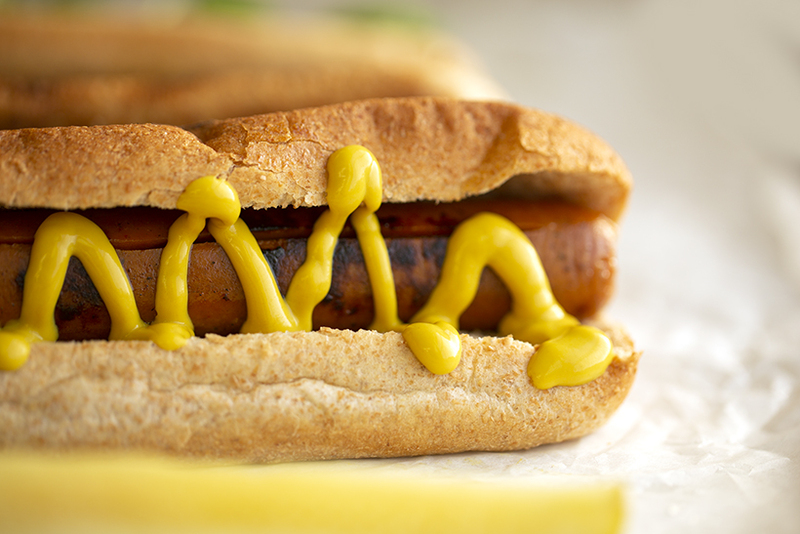 What do you love on your vegan sausages? Go simple or fancy with your Frankfurters..
"But Kath, I don't have an outdoor BBQ..." Rest assured fellow city-dwellers, you do not need a fire-loaded BBQ to enjoy summer grilling flavors. I love to serve my Frankfurters with pickles and ginger beer!.. 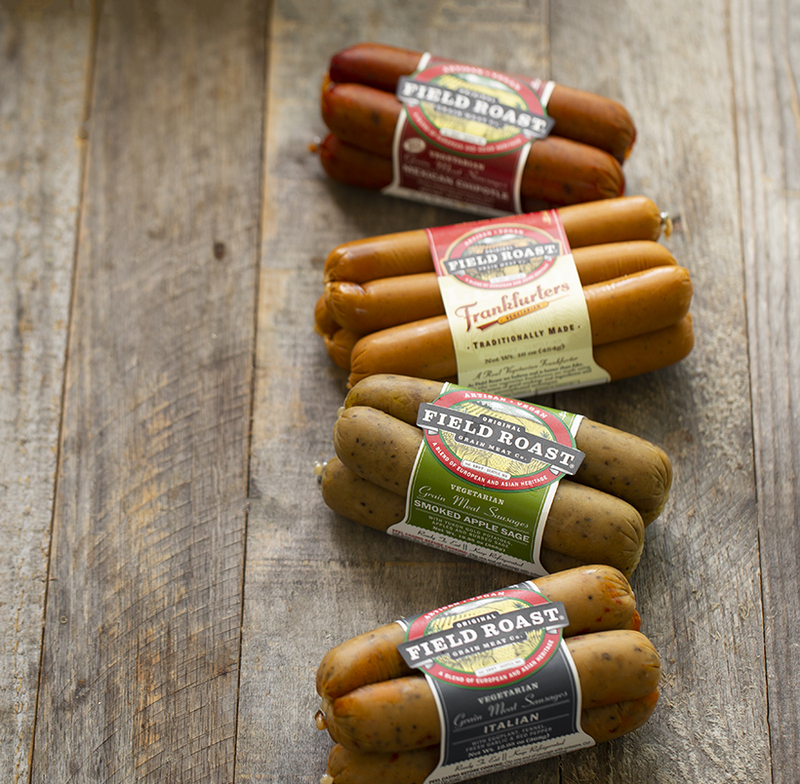 Field Roast Sausages: The Flavors. Artisan flavors, crafted with the home-cook in mind! I have been buying Field Roast sausages for many years because they taste amazing and make it so easy to flavor-boost your vegan meals. Here are some of ways I serve the various flavors. - Mexican Chipotle - A spicy-hot blend of smoked Chipotle peppers, Chili de arbol, fresh chopped garlic, sweet onions seasoned with cumin and oregano. How I use them: I love slicing these into spicy stews or pasta bowls. Also delicious grilled, served on a bun. I also love this flavor paired with vegan Mac 'n Cheese. I love the bold flavor of these sausages. They are rich and dense and the ingredient profile is so sophisticated and complex! 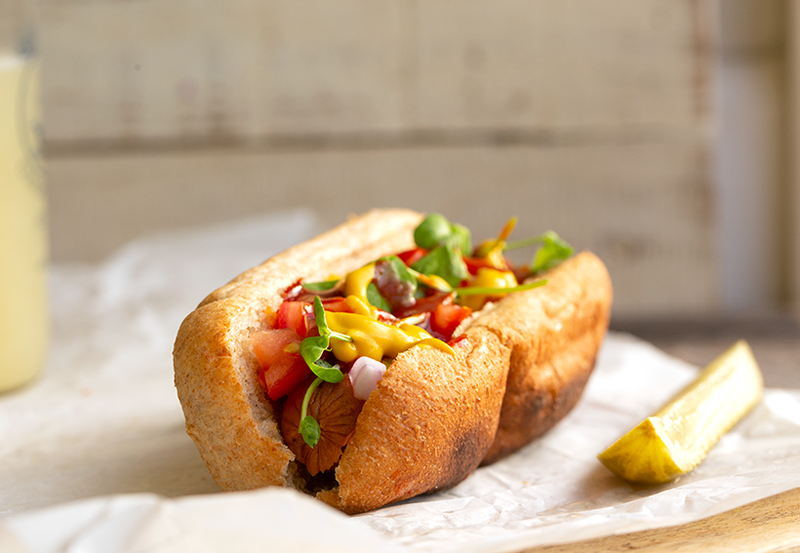 - Frankfurters - Made using real ingredients, including garlic, onions, traditional blend of spices. The most 'classic' hot dog flavor. 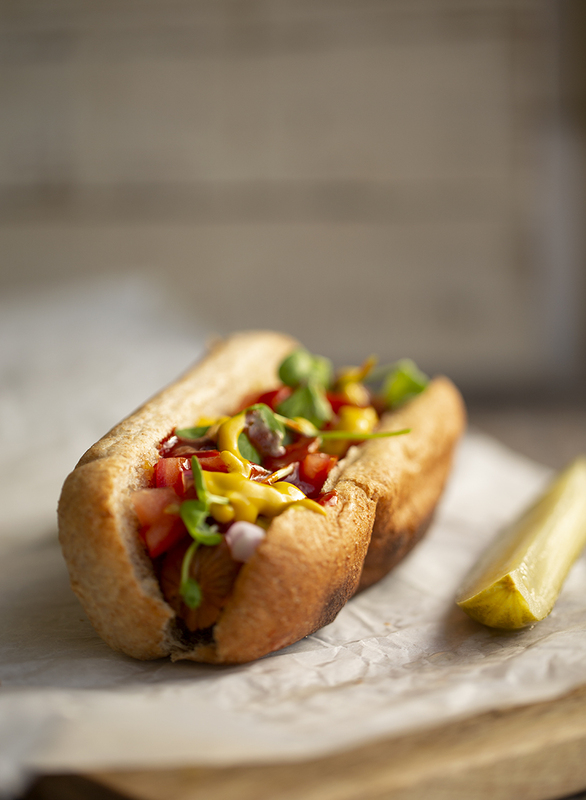 How I use them: I love these served on hot dog buns, piled with toppings. I just adore the classic-gone-vegan flavor and texture of these. - Italian Sausage - Made with fresh eggplant and packed with fennel, red wine, garlic and sweet peppers. How I use them: I love these on pizzas or in pasta. I love the flavor, reminds me of being in Italy and all the scrumptious flavors and ingredients in vegan meals over there. Yes, all that in one sausage! - Smoked Apple Sage Sausage - A savory combination of apples and sage with Yukon Gold potatoes and a subtle hint of hickory smoke. How I use them: These are my favorite for slicing and sautéing, then serving over top salad or grain bowls. This is my fave flavor to just eat all on their own, with some mustard. This flavor is just dreamy in terms of appealing flavor. Light and smoky, with a hint of sweet from those apples. SO good. ...Any of the flavors taste great on a bun or straight from a grill or skillet. How to cook Field Roast Sausages? - Skillet. Since I do not have easy access to an outdoor grill, I always sauté my sausages in my skillet. I add a drizzle of olive oil to the pan to help the sausages brown and plump. I love the charred edges I get on the frankfurters! You can sauté the sausages whole or slice into rounds. Or crumble the sausage to get bits that go great on pizza, pasta or salads. - BBQ. The cool thing about these sausages is that they can be cooked using an outdoor grill - just like any traditional meat sausage. - Soup. When adding Field Roast sausages to soups, I just slice or crumble and place right in the broth. They plump up and soften and add SO much flavor. - Microwave. If you are in a hurry, you can always microwave them for about a minute or so. - Boiling. 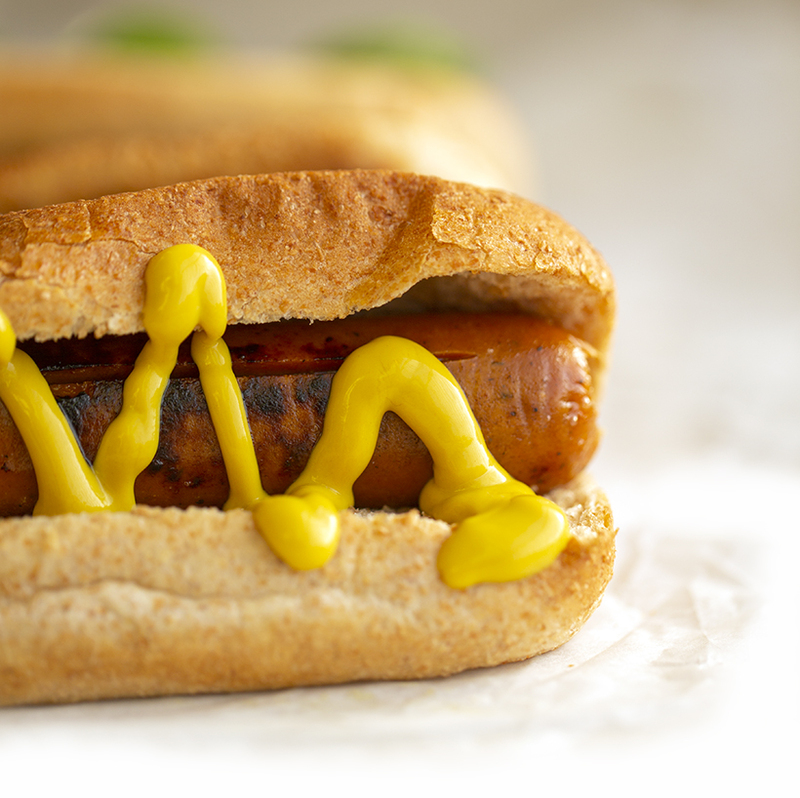 Field Roast's Frankfurters can be boiled, but some of the other flavors, I have found, are not suitable for boiling because the yummy 'juices' escape into the boiling water. You can buy Field Roast products at Whole Foods and Walmart stores or online at Vegan Essentials. GIVEAWAY! Enter to win a sampler pack of Field Roast sausages, plus a copy of my book 365 Vegan Smoothies..
Fresh-chopped toppings and high-quality products like Field Roast Frankfurters, are your direct route to vegan summer grilling success. toppings: onion, tomato, pickles, relish, cole slaw, sauerkraut..
Skillet method: Warm a skillet over high heat. Add a drizzle of olive oil to the pan. Add a few of the Frankfurters. Allow them to cook for 1-2 minutes, then roll them slightly. Repeat until all sides are a bit charred and some dark brown or blackened. This should take around five or so minutes. 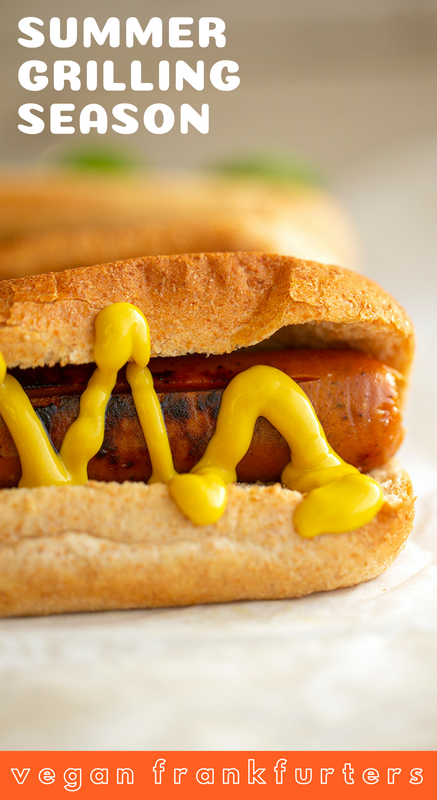 Warm buns and add Frankfurters. Add desired sauces and toppings over top. Serve warm. Vegan sausages for the win..
*Disclosure: This post is sponsored by Field Roast, but all opinions are my own.